The Perhentian Islands are a cluster of islands off the East coast of peninsula Malaysia. They are in the South China Sea about 21km off the coast of Terengganu. There are two main islands: Pulau Perhentian Besar (big island) and Pulau Perhentian Kecil (small island). Both islands have rocky forested interiors with a few jungle paths. Both islands are rich in wildlife for such a small area. You can see monkeys, lizards large and small. flying squirrels, butterflies and many other types. In the waters of Pulau Perhentian, one is guaranteed to see coral gardens as even many beaches are strewn with dead corals. 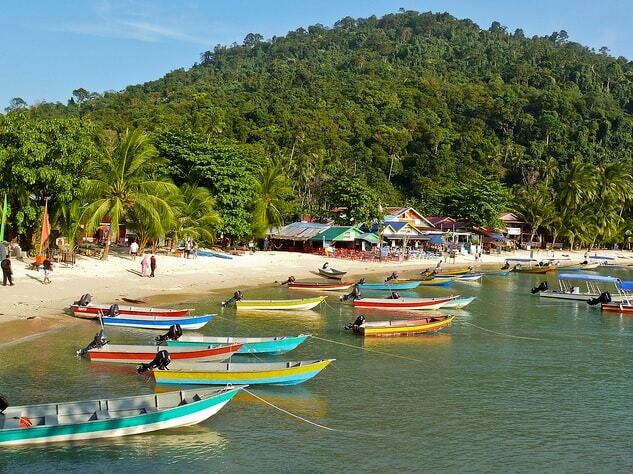 The best time to visit Pulau Perhentian is from March to October, outside of the monsoon season. A trip to this exotic tropical island is a must for all nature lovers and those who enjoy scuba diving, snorkeling, deep sea fishing, swimming, wind surfing, sailing, boating, and canoeing. It is surrounded by a virgin jungle, swaying palm trees, white sandy beaches, warm sapphire blue waters, and a colorful coral garden. Perhentian Islands is renowned as one of Malaysia's marine paradise. The boat for the Perhentian is leaving from Kuala Besut. If you're leaving from Kota Bharu to the Perhentian, you can take a taxi to Kuala Besut. If you're coming from Kuala Terengganu, you can better take the bus to Kuala Besut. Boat tickets are sold in Kuala Besut only and by some selected agents in Kota Bharu (Kelantan). It takes almost two hours to take to the islands. 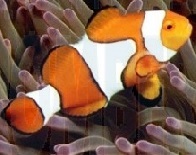 Most people, who are coming for these islands, are coming for the snorkeling and diving. There are no roads on the islands and the only way to get around is by the many small boats which ply round the islands delivering guests, food, and collecting rubbish. Tourism is new to these islands, in fact, the past five years has seen rapid increases in tourism numbers and we now have many new rooms and services to accommodate guests. 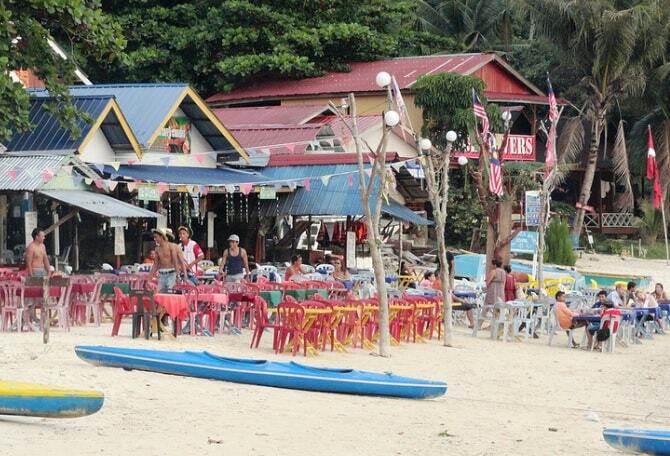 Pulau Perhentian is fast developing. Fishing without a license & Causing Pollution, i.e. littering Possession of spear fishing equipment. If you are lucky you may find yourself swimming next to a turtle - the bigger they are the older they are, possibly 100 years old - a wonderful sight. They are cautious animal and slow in movement because they conserve energy, so please do not approach too closely or touch them. When you see a turtle in these waters it is here for mating and laying of eggs and must not be disturbed. Turtles are an endangered species. They feed on plankton and other surface marine life and they often found dead due to eating plastic bags which they cannot digest that they mistake for jelly fish, so please do not throw your rubbish to the sea. Watching turtles as they lays their egg on the beaches has to be extra cautious or else it will disturbs them and they will go away. Before, turtle were in hundreds but recent years have seen rapid decline in numbers. Perhentian and Terengganu are the few remaining sanctuaries for them in the world. 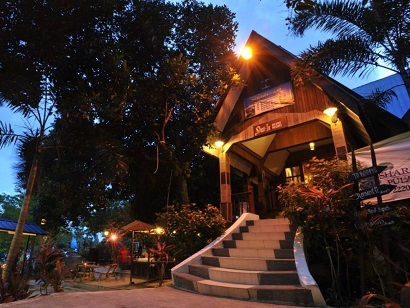 Designed for both business and leisure travel, Shari-la Island Resort is ideally situated in Pulau Perhentian Kecil; one of the city's most popular locales. From here, guests can enjoy easy access to all that the lively city has to offer. No less exceptional is the hotel's easy access to the city's myriad attractions and landmarks, such as Pulau Perhentian Beach.